TreeHacks, Stanford’s first large-scale collegiate hackathon, took place at the Frances C. Arrillaga Alumni Center this weekend and attracted over 670 participants, including 369 Stanford students. The 36-hour event brought together college students from all over North America to “hack” in teams and create their own technology projects. A total of 124 projects were submitted by 11 a.m. on Sunday morning, and the top eight teams had the opportunity to demo their work. After being selected by a group of over 20 judges, final awards were decided by a diverse panel of seven, including professionals from the technology industry and Stanford computer science faculty professor Mehran Sahami ’92 M.S. ’93 Ph.D. ’99 and lecturer Jerry Cain M.S. ’98. MetroArm, made by two students from Purdue University and the University of Waterloo, won first prize for a robotic arm controlled by a Leap Motion controller. Leap Motion is a device that tracks the motion of its user’s hands and fingers and translates them into computer input. The team won trips to Taiwan and Seoul to compete at HackNTU and Global Hackathon Seoul, respectively, and also received tickets for a ZERO-G Experience provided by Zero Gravity Corporation. Fabric, a team that included Stanford freshmen Liezl Puzon ’18 and Sabar Dasgupta ’18 and students from the University of Rochester and Princeton University, won second place for their project, which also used a Leap Motion device alongside an Oculus Rift Virtual Reality headset to create an interface for designing and manipulating objects for 3D printing. Third place went to Wake, a team from Michigan State University, an app that used mobile devices to detect when users have fallen asleep at a non-scheduled time. Both teams received various hardware prizes such as an Emotiv EEG headset and a Parrot drone. Participants also voted for their favorite hack in the top eight using Democracy2.1 and chose MAKKMat, a “smart” mat that detects various exercises, such as planks and push-ups, and sends the repetition and activity data to the user’s phone. The team included Stanford masters students Michael Weingert M.S. ’16, Adam Craig M.S. ’16 and Kornel Niedziela M.S. ’16 and USC student Kaitlyn Lee and was awarded a trip to Hawaii. In addition, 63 prizes were also presented by various sponsors including Apple, Orange GigaStudio and Microsoft. Interdisciplinary work was also highlighted through prizes from Stanford’s English and history departments to highlight the new CS+X joint major programs. 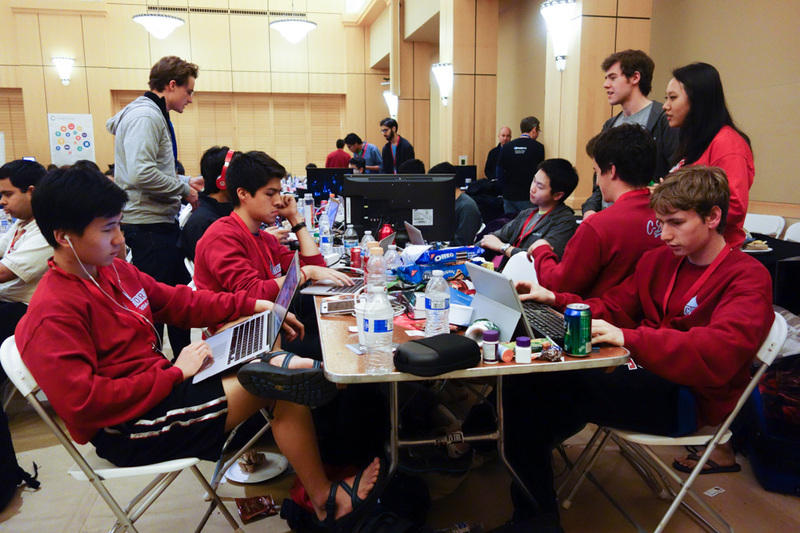 The hackathon was co-directed by Rishi Bedi ’17, Russell Kaplan ’17 and Jason Teplitz ’17, and TreeHacks’ internal team included 20 Stanford students and several volunteers. The event was organized by the Business Association of Stanford Entrepreneurial Students (BASES) HackSpace. “We were incredibly excited to see all of the amazing work the hackers created, which made everything worthwhile,” Bedi said. Kylie Jue contributed to this report.